Dog Bites Mailman, Mailman Bites Back. This is a story about a dog that bit a mailman. Only this time, the mailman bit back – against the dog owner’s insurance company. Harry Evans was delivering mail in 1980, when a dog ran out and bit him on the forearm, causing nerve damage, a permanent scar and an atrophied biceps muscle. The dog owner had a $25,000 liability policy with Continental Insurance Company. Shortly after the incident, Mr. Evans’ original lawyer demanded that the insurance company pay the policy limits. They refused. Continental eventually offered $10,000 and then very slowly increased their offers until, finally, two years later, they coughed up the full $25,000 policy limits. In the meantime, nothing had changed about the case. 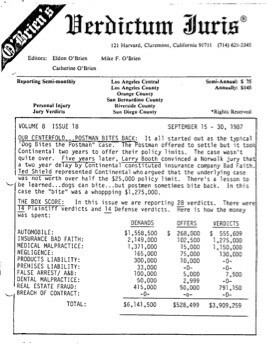 All of the pertinent medical information about Mr. Evans’ injuries was included with the very first letter from his lawyer to Continental. 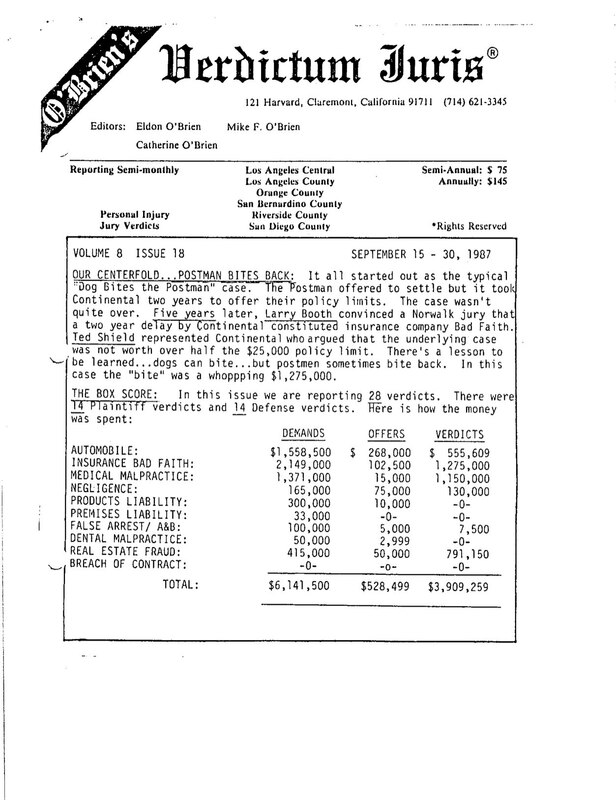 Mr. Evans’ original lawyer then brought us in to sue Continental for bad faith in an insurance dispute lawsuit. We alleged that the company violated the Insurance Code by delaying payment of a legitimate claim without good cause. The two-year delay in paying the $25,000, we argued, was simply an attempt by the insurance company to save money at Mr. Evans’ expense. The case proceeded to trial. A key ingredient at trial was the testimony of an attorney who was formerly employed by Continental. He had taken over the handling of Mr. Evans’ dog bite case for the insurance company after two years of stalling by other employees, and he immediately recognized that the case was worth $25,000 and that the prior negotiations were not in good faith. He later left Continental in a dispute over its handling of an insurance claim asserted by his wife. The company stalled and delayed on his wife’s claim, just as they had done to Mr. Evans and others! At trial in the bad faith case, the former Continental attorney testified that not only was the company’s handling of Mr. Evans’ claim in bad faith, but it was consistent with the company’s normal business practices. Rather than pay claims in a timely and fair manner, Continental would “low ball” plaintiffs, in the hope that many would need the money and would accept these unfair offers. A few plaintiffs would have the backbone to keep fighting, and in those cases, Continental would eventually pay what the case was worth. In the meantime, however, the company saved millions of dollars by this unfair practice. After just five hours of deliberations, the jury returned a verdict for $1,075,000, which consisted of $75,000 to compensate Mr. Evans for the emotional distress that he suffered while the insurance company delayed paying his claim and $1,000,000 in punitive damages to punish the insurance company for its regular business practice of “low ball” settlement offers. This verdict was featured as the “centerfold” result in the Verdictum Juris publication for attorneys.